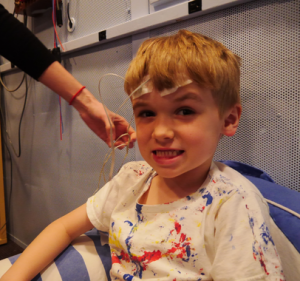 At Brainvolts we have discovered how to listen to sound processing in the brain. The integrity of this processing bears on our everyday learning, language, and communication. As a child, one of Nina Kraus’s favorite places to play was underneath the piano, while listening to her mother playing Scarlatti, Scriabin or Brahms. “I’d bring my toys and little things with me – it just felt good to me to be under there,” recalls Kraus, who now directs the Auditory Neuroscience Laboratory at Northwestern University. Her mother’s professional piano playing was just one of the rich and compelling sounds in her childhood. In addition to live music, her home featured the lyrical voices of her European-born parents, who spoke Italian, French and German. 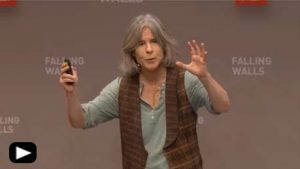 Kraus says that those early experiences made such an impression on her that studying how we process sound became her life’s work. 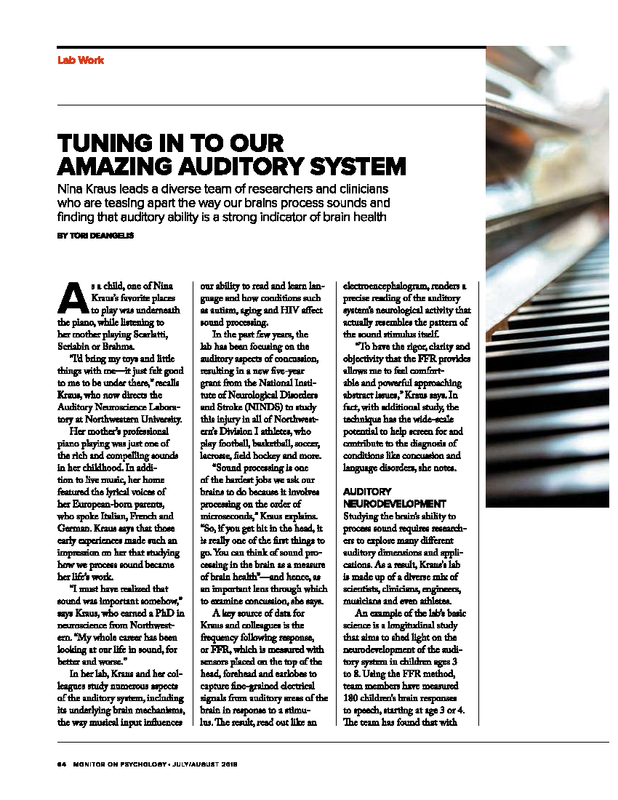 In her lab, Kraus and her colleagues study numerous aspects of the auditory system, including its underlying brain mechanisms, the way musical input influences our ability to read and learn language and how conditions such as autism, aging, and HIV affect sound processing. In the past few years, the lab has been focusing on the auditory aspects of concussion, resulting in a new five-year grant from the National Institute of Neurological Disorders and Stroke (NINDS) to study this injury in all of Northwestern’s Division I athletes, who play football, basketball, soccer, lacrosse, field hockey and more.